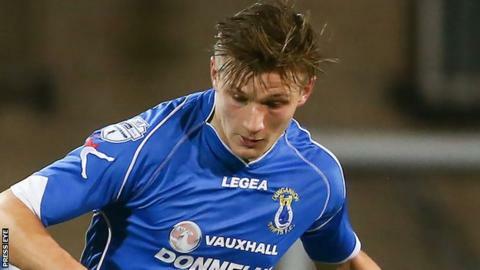 Warrenpoint Town's fine run of league results came to an end as Andy Mitchell of Dungannon Swifts scored the only goal at Stangmore Park on Monday night. Mitchell pounced on a mistake by Town defender Jordan Dane to net from close-range in the 33rd minute. Just before half-time Warrenpoint's Sean Donnelly struck the post with a fine effort from 25 yards. The narrow victory takes Dungannon four points clear of bottom-placed Town who had been unbeaten in seven. Warrenpoint manager Barry Gray: "It wasn't one of our better performances, but we did create plenty of opportunities. "It is just disappointing that we did not take any of them. "We knew a game like this was on the horizon, with everyone fighting tooth and nail at the bottom. "We didn't perform in the first half. It was better in the second but we couldn't score." Dungannon manager Rodney McAree: "We were dogged and showed good character. "We worked hard defensively, although we were maybe fortunate to keep a clean sheet. "Andy Mitchell had not scored for a couple of weeks and I think it was playing on his mind, so thankfully he has got over that hurdle. "We have to push on now and get more points."